I don’t know if you are like me but I often plan my meal based on what my body asks. For instance, we had a lot of vegetarian dishes this week. One of them was my sweet potato red lentils soup. My kids were literally licking their plates. I planned it for two dinners but had to improvise something else for the day after. I hope you will give it a try, it’s super easy to make, delicious and just perfect for something light but filling for the evening. 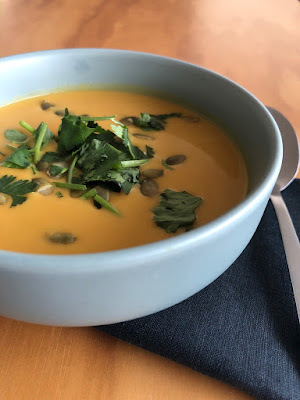 Besides, this soup is loaded with vitamin A! 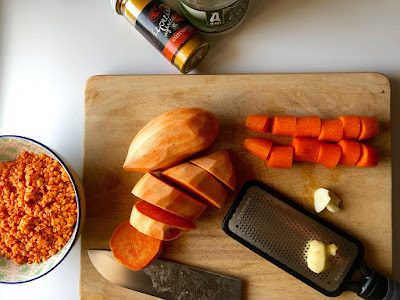 Have all the ingredients ready then peel and chop the carrots and sweet potatoes in big chunks, mince the onion and the garlic, grate the ginger, wash the red lentils. In a large saucepan, melt the coconut oil and add in the onion, the garlic, the ginger, the turmeric, and some black pepper. Stir until fragrant. Then transfer the red lentils, the carrots, and the sweet potatoes. Submerge them into water and cover. Bring it to a boil and then lower the heat to the minimum until the carrots become soft. Turn off the heat and let it cool before you blend it with a hand mixer. Then add the coconut milk, combine well. You can now season with the salt to your liking. If you give it a try, don’t forget to let me know in the comment. J'espère que ma recette va vous plaire. La combination de ces légumes me fait penser à la soupe de potiron et chataîgnes; deux choses qu'il est difficile de trouver ici. N'hésitez pas à partager ma recette et me suivre sur Instagram.